Enjoy this verbal and visual Moroccan feast brought to you by two of Tunis’s acclaimed restaurants. Shared regional influences and geography unite the culinary traditions of Morocco and Tunisia, yet they are far from redundant. Moroccan cuisine is more familiar to the outside world than Tunisia’s. I have to argue that this phenomenon is for good reason! El Omnia is a sleek Moroccan restaurant at the Movenpick Hotel in Gammarth, Tunis. Its feel is contemporary. Ruby and pale grey tones pervade. Tea lights, embedded in the floor, twinkle like stars as they illuminate path to the tables. Once seated at banquet style booths, ornate red and gold place settings create a regal feel. The wine: My favorite Soltane syrah/merlot blend happily was available. With a touch of oak and dark cherry notes, it is reminiscent of a young French wine and not inappropriate for Moroccan cuisine. The food: Slightly dry and spongy rolls, topped with sesame seeds and with scant anise seeds, inside greeted us immediately after ordering. My trio ordered hors d’oeuvres morocain, a platter of several chilled cooked Moroccan salads: carrot, green peppers, eggplant, and octopus. For entrees, we shared a lamb tagine (the meat was slightly tough but flavorful), chicken and olive tagine, and a chicken pastilla. Sidebar explanation: A tagine is essentially a stew, named for the two-piece ceramic pot used both to cook and serve it. It is recognized by its uniquely shaped lid – like an inverted funnel. It was designed to minimize the amount of water needed to cook it by preventing liquid from evaporating during the low and slow cooking process, which traditionally takes place over charcoal. The pot itself doubles as a serving dish. Usually a combination of sweet and savory – typically meat, vegetables and dried fruit, Moroccan tagines are often seasoned with cinnamon, saffron, ginger, coriander, and cumin, to name a few common spices. Sidebar complete. I ordered a chicken pastilla (AKA Bastilla or b’stila), a wonderfully and strangely sweet meets savory meat pie. A flaky pastry crust studded with almonds and powdered sugar surrounds a cinnamon spiced poultry filling. That filling is traditionally pigeon, but today, you’re more likely to find it made with chicken instead. We ordered a plate of Moroccan cookies for dessert (the featured image for this post). We noticed immediately that many of them had a disinctively floral taste – rose water and lavender. It occurred to us that this combination resembled the scented oil that perfumed our entire hotel (not this hotel). Other cookies on this plate included a crisp wreath ringed with sesame seeds, an apricot stuffed with a thick almond cream, and and a crunchy, bite sized shortbread-like almond cookie. 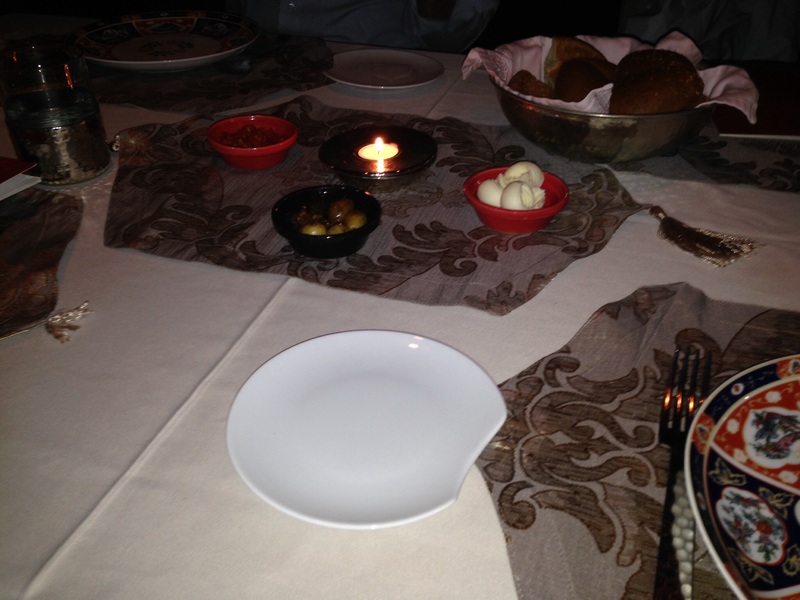 Several of us seized the opportunity for a “traditional oriental” feast at The Residence Hotel’s El Dar restaurant. El Dar’s style is clearly traditional – special event or otherwise. As such, traditional tones and patterns decorate it: carved, dark wood tables and chairs, tasseled pillows with bright Berber striped patterns. 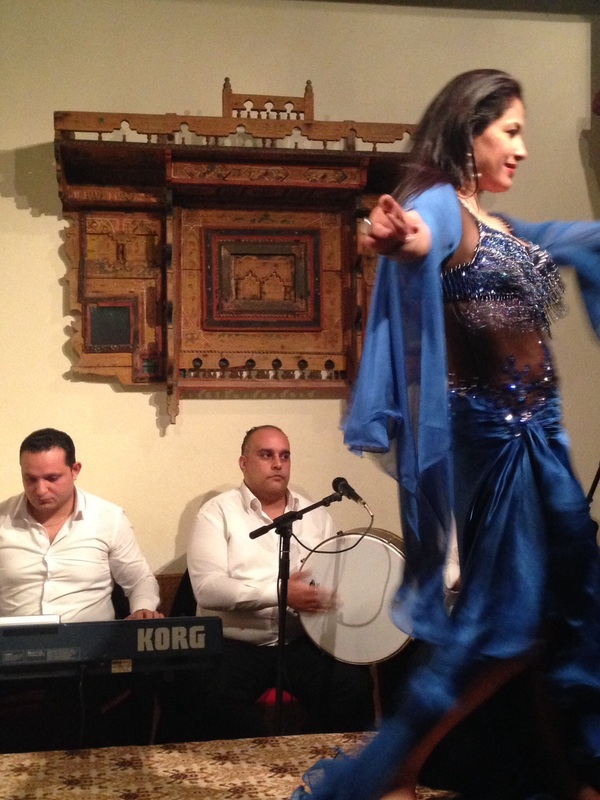 The restaurant typically serves Tunisian and other North African traditional dishes, but on this occasion, it offered a full buffet and entertainment – to include musicians and, of course, a belly dancer. 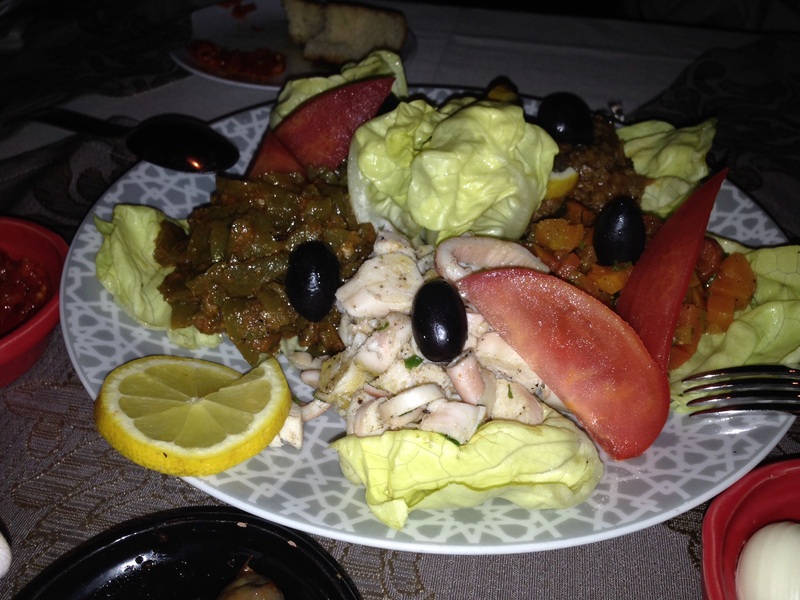 An array of warm and cold salads, tagines (essentially, stews), and desserts more than satisfied us. The buffet presented a long list of cooked but chilled salads typical of North Africa – carrot, eggplant, green pepper, tuna, green leaf salad with egg and black olive. Thick flatbreads helped mop up the salads. Meats were largely served as tagines. The lamb was tender and fragrant with a hint of cinnamon. It was the best lamb tagine I had since Bolivia (at Rendezvous, a story from another post). A delicious fish appeared to have been baked with a topping of egg and or fresh cheese – whatever odd combination it was, it was quite tasty – the sum was greater than the individual components. The dessert buffet sucked me in well past the point of regret. 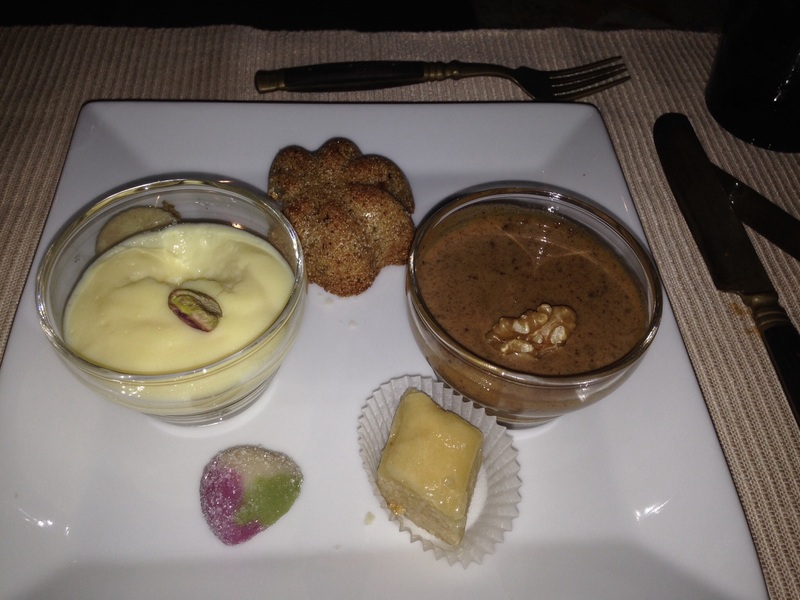 As pictured above, sticky baklava-like small bites, ring-shaped cookies accented with subtle but distinctive rose water, a creamy pudding with lavender, and my favorite – an intense hazelnut pudding packed with ground hazelnuts. You need not travel to North Africa to experience the joys of a Moroccan feast. I love that so man cities around the world have wonderful, authentic Moroccan restaurants. Whether you are new to Moroccan food or a veteran, I hope you’ll be inspired to experience it again!